Preparing your car to be driven in winter conditions may take a few extra minutes, but these may very well be the most important minutes of you spend all day. Before you drive off, make sure that your headlights and windshield are clean and free of any snow and ice buildup. Be sure to remove snow from the roof, hood, trunk or rear deck of the vehicle. This will prevent snow from blowing off and onto the following driver and causing a distraction for them. Make sure that your tires are not worn past the tread indicators. —Tires with no tread, or low tread, cannot effectively navigate snow, sleet, and ice. —To determine if your tires need to be changed, put a penny between the threads. If Lincoln’s head is visible, your treads are too low. —If you have bad tires, buy new ones. The cost of new tires will be far less expensive than getting into an accident and having to deal with the consequences. —Freezing weather can also cause low tire pressure. The combination of low treads and low tire pressure can be extremely dangerous in heavy traffic. —Bear in mind! Not only should you consider your own safety, but the safety of others as well, whether they are passengers in your vehicle, passengers in another vehicle, pedestrians, or other motorists. —Wiper fluid with additives that melt ice is inexpensive. —Your car may require a different kind of coolant to keep from freezing. So, when you take your vehicle in for scheduled maintenance, ask the mechanic to check your antifreeze levels and to make sure that you are using the right type. If it’s possible, it is also a good idea to add some additional weight over the rear axle of your vehicle for better traction. Know what road conditions that you will be driving in. Be aware that bridges and overpasses become icy before other areas of the road. So, be especially careful when driving on these surfaces. Find out how to brake effectively when you’re driving on ice. This means knowing if your vehicle is equipped with anti-lock brakes. Have a look at your owner’s manual or speak to your mechanic. Do whatever you can to improve your visibility. This might mean driving with your headlights on in the daylight. Drive slower in bad weather and keep a safe distance between you and the car in front of you. Make sure you have more than enough time to stop abruptly without getting into an accident. You need to be in full control of your vehicle when driving on snow or ice, so avoid using cruise control. To summarize, driving in winter weather can be extremely dangerous. Take action to avoid being injured in an auto accident! If you must drive in bad weather conditions, be prepared and always drive carefully. If you or someone you know has been injured in a car accident due to another’s negligence, you may be entitled to compensation. 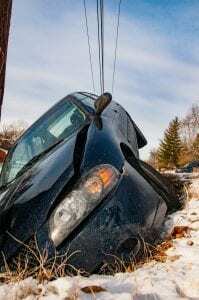 Contact an experienced car accident attorney for a free evaluation and to learn if you have case against the person responsible. What Are The First Steps In a Nebraska Workers’ Compensation Claim? How Much Injury Experience Should My Attorney Have?